Animal sightings are often enjoyed while hunting our sedentary friends. Sometimes the tracks they leave behind are the only evidence we have of their visit. Tracks can be animal footprints, impressions, rubbings, dung or plant damage. The trees are beginning to leaf out in earnest now. Cherry trees are showing their white blossoms which are short-lived and last for about a week. On the left side of the drive you can see a cherry tree blooming. Cherry blossoms brighten the driveway as the trees are still developing their leaves. There is a little patch of Rue Anemone along the gravel road which comes back year after year. This patch receives morning sun and is shaded in the afternoon by a big oak tree. Rue anemone is also known as Windflower, Anemonella thalictroides. The three-lobed leaves are in whorls and the white to pink petals, sepals really, number 5 to 11. A root tea was used by Native Americans to treat diarrhea and vomiting. As always take caution in ingesting any member of the buttercup family, like Rue Anemone, as they are toxic to some degree. 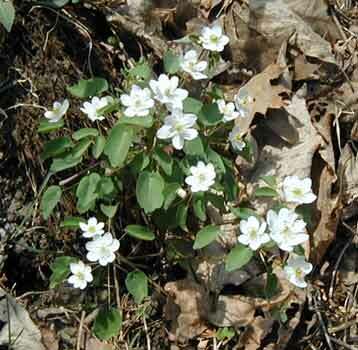 Rue anemone, or Windflower, is a showy Spring woodland flower. Podophyllum peltatum, will appear in a couple weeks. Mayapple, also known as American Mandrake, is a perennial woodland favorite. Walking about the woods this week I did see my first snake — a small, brownish garter snake. I was surprised that I had not seen any snakes until this point in the season as we have been having unusually mild weather. Since the first sighting, a black snake and another garter have been spotted. The dogwood trees are beginning to bloom. A faint white color is noticeable from a distance, but the blossoms should be more prominent in a few days. A favorite tree of mine is Sassafras, Sassafras albidum. It is a member of the Laurel family along with cinnamon, sweet bay, avocado and spice bush. 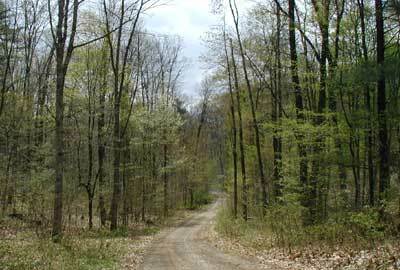 When the leaves or branchlets are broken they give off a pleasant odor. I’ll often break off a leaf or stem of sassafras for a little do-it-yourself aromatherapy. The sassafras flowers about the time the leaves are starting to appear. Male flowers have 9 stamens and female flowers have 6 sterile stamens and a central pistil. Each flower is small, 5 to 8 mm in diameter, and has 3 yellow petals and 3 yellow sepals that look alike. 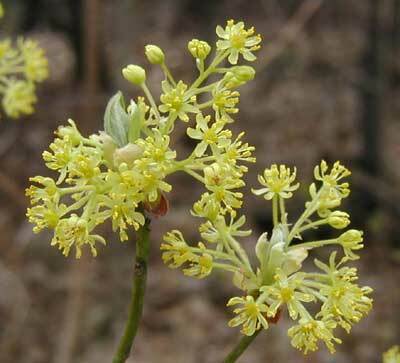 Sassafras male flowers are showy at the edge of the woods. Looks like we’ll be lucky this year and experience two Spring bloomings! Vacationing in North Carolina last week we saw dogwoods, azaleas, lilacs, oxalis, violets, buttercups, wild strawberries and vincas in full bloom. The timing was too early for the garden roses, although there were buds present, and we were just in time to see the first garden iris bloom. 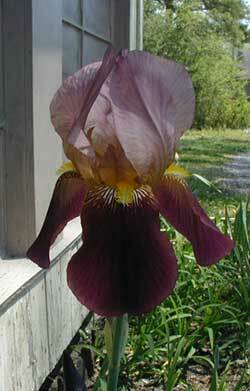 This beautiful iris just opened to greet the sunrise. On our next trip to North Carolina I’ll get a cutting of this gorgeous Formosa azalea — its blossoms are probably two to three times the size of a typical azalea bloom. 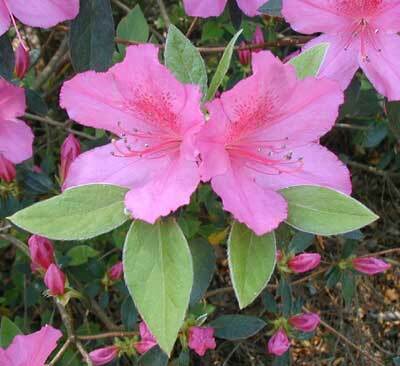 Beautiful Formosa azalea practically shouted — It’s Spring! A wildflower that caught my eye was the Star-of-Bethlehem which appeared in the lawn. The white blossoms contrast nicely with its bright yellow stamens. It has a habit much like the oxalis in that its blooms open in the sunlight and close without the sun. It took until about noontime on a sunny day for the blooms to fully open. 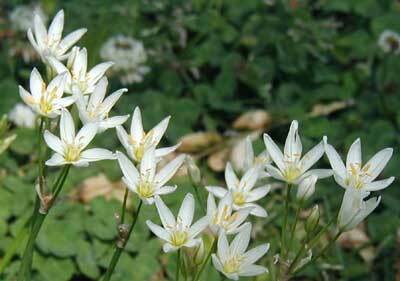 The Star-of-Bethlehem has basal leaves that are entire and have a pale midrib. The white petals have a distinctive green stripe on the backside. The white blossoms of Star-of-Bethlehem open only in the sunshine. We stayed with friends on our vacation to collect marine fossils from sediments that date back to over one million years. 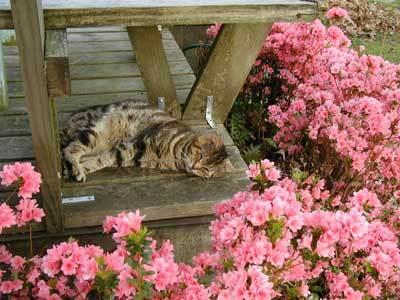 Their very affectionate cat, Squeaky, found a great place to soak up the morning sun as he lay near the pink azaleas in full bloom. Squeaky soaks up the sun! We had a fantastic time on our trip and can’t wait to repeat it. During the recuperative days when we were not crawling around on our hands and knees looking for fossils, we enjoyed our time visiting with our friends and watching the hummingbirds chase each other from the sugar water feeders. The plentiful flowers attracted many swallowtail butterflies like this female on a lilac blossom. 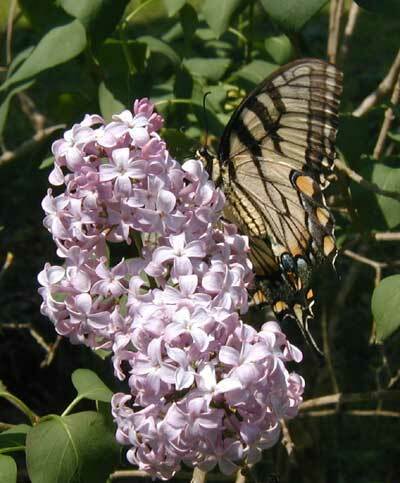 A female swallowtail butterfly sipping nectar from a lilac. Thanks to Pat and Ken for a fantastic vacation! See you again real soon!! 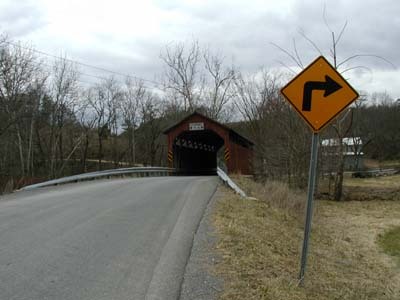 Out for a Sunday drive today we came upon a one-lane covered bridge. Reconstructed wooden bridge in Central Pennsylvania. Plank wooden floor clappety-claps when you cross the bridge. 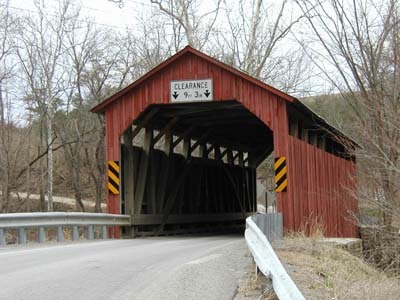 Close-up of the covered bridge. Were all of them red? Trees to the left along the creek give away their identity by showing off their beautiful white trunks. These cottonwood trees are almost always found near water. Cottonwood trees along the creek sporting white bark. 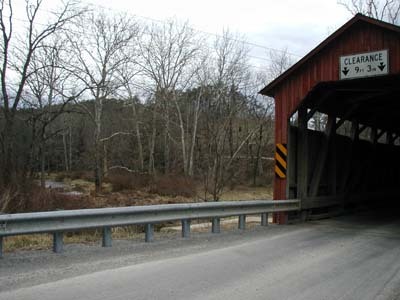 Covered bridges were constructed in sections to help fortify the roof and the entire structure. 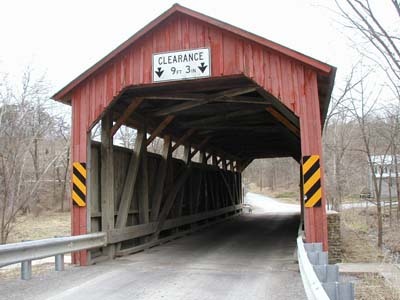 Large wooden members make up this reconstructed covered bridge. Inside the covered bridge you can see how it was constructed. Just after passing through the bridge we spotted a nice grouping of Coltsfoot growing near the roadside and an active spring. The weather has been quite dry of late so I wouldn’t expect this to be any runoff other than from a natural spring. Coltsfoot growing in a moist area near a spring. Coltsfoot blossoms are probably mistaken for dandelions by many due to its bright yellow blossoms. Closer inspection reveals the blossoms are atop scaled stalks with some reddish tones, not a smooth light green stem like the dandelion. At this stage of growth the green leaves have not yet appeared. The outline of a leaf is in the shape of a colt’s foot, so that is where coltsfoot gets its name. 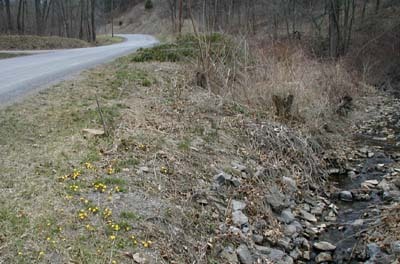 Bright yellow coltsfoot blossoms along a road in Central Pennsylvania. Driving back to the house we saw a brave little groundhog run across the road and back again before we got very close to it. These chickens were out of the coop for a breath of fresh air, too! Rooster and chickens out in the barnyard. When we got to our dirt road we watched a pileated woodpecker as he moved from tree to tree in search of lunch. Sounded like a great idea to us! The water in the outdoor cat dishes has been frozen solid for three mornings in a row. This morning it was 32 degrees and the wind chill was 22, so the cats must have appreciated staying in the garage for the night. The suet feeder in the backyard was knocked to the ground, opened and emptied of its goodies. Since the dog went crazy sniffing around the area and barking quite excitedly this morning, we wonder if the neighborhood bear made a late night visit for a snack. This time of year must find the bears quite hungry! There has been a lot of bird activity at the window-mounted feeder — they just love the sunflower seeds, don’t they? We hope the window feeder is too high up for the bear to reach. Well, as far as the plants go, they are not making much progress in emerging from their winter rest. 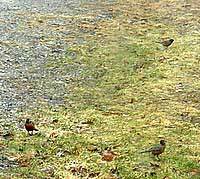 Now that the weather is colder than normal the Spring emergence has been put on hold for a short time. A few more maple trees have cracked open their winter buds, but we don’t expect many more signs of Spring until the nights get above a chilly 30 degrees.